I’ve never been to Hawaii myself, but several of my friends have been on holiday there during the last year. They’ve all brought back delicious snacks, and there’s always some kind of macadamia-based treat included amongst the bounty. I don’t know what it is about this state, but it must be overflowing with macadamia nuts. The last friend of mine to visit the 50th state brought back what has been my favorite macadamia treat so far: macadamia nut liqueur. Being a gift from Hawaii, this ingredient was destined to be mixed into a macadamia-themed tiki drink, like Joe’s Tkach Tiki Delux, only we wanted to make sure that the macadamia flavor was the main attraction, so Joe and I blended up this tropical treat. Behold! Add all ingredients to a blender with plenty of ice. Blend until the ice is crushed. Pour into four glasses and smack some mint leaves for a garnish. Something about blended tiki drinks is just really pleasing. What begins with a minty scent is followed by bright tropical notes from the fresh pineapple and citrus juices. The macadamia’s sweet nutty taste rounds out a rummy swallow. Personally, I like to keep the ice in my mouth and munch on it afterwards, but I’m weird like that. 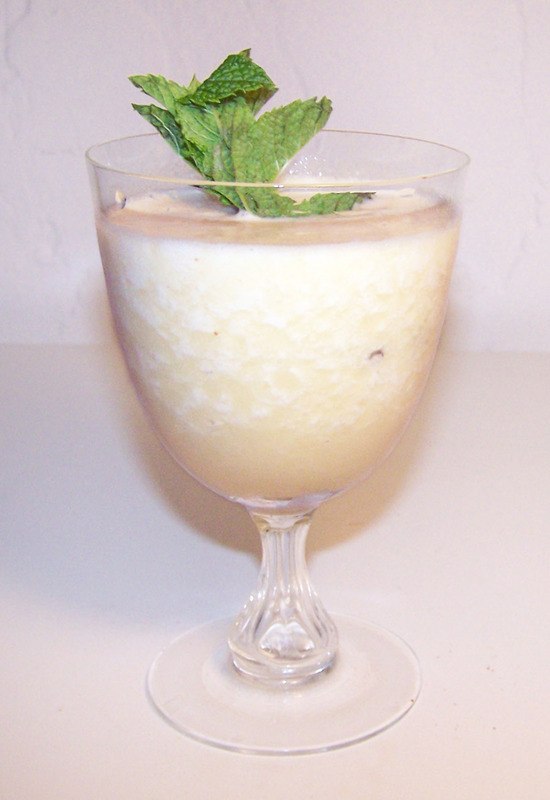 We regret that the garnish was not grandiloquent, however, mint was definitely the right choice for this drink. I always enjoy tiki drinks that come with a fruity garnish, but in our haste to mix other drinks we neglected to cut a pineapple wedge. I guess nothing we could have done here would top the pineapple-as-a-vessel piña colada we made a while ago. If you choose to create a more impressive garnish, you really should keep the mint spring in the mix, as it provides a critical fragrance to this drink. Categories: tiki | Tags: alcohol, bartending, blended, blender, booze, cocktail, cocktails, coconut, coconut cream, drink, drinking, drinks, lemon juice, lime juice, liqueur, macadamia, macadamia nut liqueur, matusalem, mixed drinks, pina colada, pineapple, rum, Smith & Cross, tiki | Permalink.